In recent years, interest in the Texas Longhorn has gained popularity. The traits of these cattle, in terms of hardiness, joy of ownership and longevity, help ensure their popularity among recreational and serious cattlemen alike. 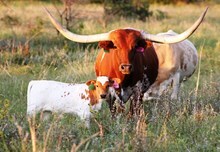 No two Longhorn cows are exactly the same, and when cows calve it is like opening a Christmas gift. You never know what to expect! Few things in life captivate the eye and emotions like Longhorn cattle grazing in a green pasture. All our cattle are shown below. We hope that you enjoy them as we do. Her pedigree is smoking hot! She is an easy cow to work and will reach 90"TTT before long. Atterbury Pasture. Nice Panther Creek bred cow out of Hot Spots 7. Very calm and easy going. A joy to own! Confirmed bred to TKR Tuff Blitz at this time. Spring herd. Atterbury front pasture. We love this cow! Wiregrass breeding at its finest! 51 pasture. Stunning brindle cow. Excellent mother and dog gentle! Lots of color and great temperament. Confirmed bred to Cowboy Remedy at this time! Atterbury Pasture. About as much horn as you can stack in one pedigree! It's no surprise, she's won two bronzes. Very calm and easy going cow. Confirmed bred at this time. Spring herd. Atterbury pasture. Wonderfully thick horns. Excellent mother. Spring herd. Atterbury Pasture. Beautiful red and white lineback cow out of a heavy horned black WF Commando daughter. Confirmed bred at this time. Spring herd. Beautiful young Drag Iron daughter. Confirmed bred to Sniper at this time. Atterbury Pasture. Confirmed bred at this time. Bellview Pasture. Fall herd. Confirmed bred to Farlap Chex at this time. Blount Pasture. Very complete Tejas Star daughter with correct structure and well balanced body. She is a very tall heifer with an excellent temperament. 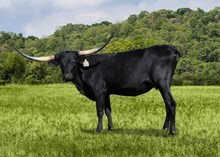 Now bred to JH Rough Country, two time composite horn showcase winner. Atterbury pasture. Look at this cow's pedigree....tons of horn potential! Confirmed bred to Cowboy Remedy at this time. Spring herd. Bellview Pasture. Fall herd. Confirmed bred to Peacemaker at this time. Bellview Pasture. Fall herd. Very sweet and kind heifer. Confirmed bred at this time. Atterbury Pasture. Very sweet, easy going young cow. Hermes pasture. As good a heifer as we can raise! Hermes pasture. Beautiful young heifer with tons of predictable potential. Solid genetics! Millennium Futurity eligible. Hermes pasture. Beautiful Saddlehorn heifer. Hermes pasture. Love this heifer's breeding! Gorgeous Rocky daughter! Should be a large bodied female at maturity with a TON of horn! Drop dead gorgeous painted heifer out of one of our favorite cows!